Ukisociety has several hymns he plays on the ukulele. With “Trust and Obey” he uses the chords F C7, F, C, F, Bb. When I was growing up we would go every Sunday to the big, white church on the corner. Every service started with “Holy, Holy, Holy”. I used to know the first three stanzas by heart, but that was a few years ago. 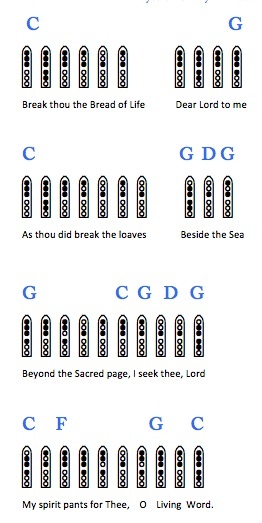 A list of public domain hymns in the United States from a site on Public Domain Information. The site claims you should find a published copy of the song with a copyright date of 1922 or earlier.